The MP Professional Examination Board has finally started Online Application procedure for High School Teacher (उच्च माध्यमिक शिक्षक) Recruitment. There are total 17000 Posts of High School Teacher for the recruitment is going on. Interested candidates can check the complete information about this recruitment. Here we have collected all the required information about this job notice. Candidates are advised to check the MP Vyapam Teacher Recruitment 2018 complete details here. 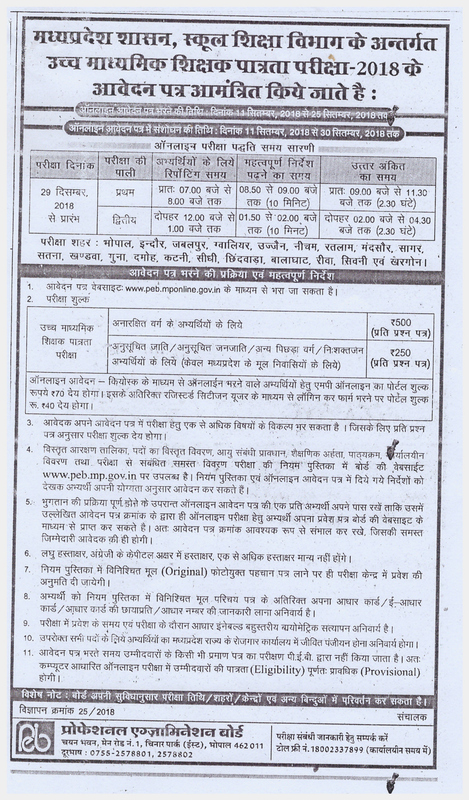 You have to apply online for these latest teacher vacancies in Madhya Pradesh state. Selected candidates will get the minimum salary with a pay band of Rs 36200 with Dearness Allowance. Interested candidates should be 21 years or older to apply for these vacancies. The upper age limit is based upon the category of the job and nature. You can check the Detailed Official Advertisement for more details about the age. Age relaxation for upper age limit is also applicable for reserved categories. The age will be calculated on 1st Jan 2019. Candidates should have Post Graduation Degree with second class and BEd in a respective subject. Rs. 70/- should be paid if anyone applying through MP Online Kiosk or Rs. 40/- (With GST) should be paid in case of a personal application for All Category Candidates. Eligible and interested candidates should open the official website that is www.mponline.gov.in. Go to the latest recruitment section and download the official notification. Firstly, read all the details in the notification and if you eligible then collect the required documents. Start applying online and upload all necessary documents on the portal in the prescribed format. Pay the fee online and submit the reference or transaction no.